You can build the best membership site in the world but if you don’t promote it, you won’t make any money from your best laid plans. The following tips will keep the traffic flowing to your website and your income growing by leaps and bounds. No matter what type of membership site you have, you’ll be sure to find some inspiration in these tips. Article marketing is by far one of the most accessible forms of online marketing. Research the top keywords for your niche, write a quality article and distribute it to a few top article directories like EzineArticles.com. It doesn’t get any simpler than that! When you’re running a membership site, affiliates can be your best allies in getting new members. An affiliate program that pays well and that offers affiliates tools like articles, solo ads and e-mail messages will attract top affiliates and bring you new customers. Register your membership site with Clickbank to reach a wide pool of affiliates. Unlike affiliates, JV partners get a special level of commission by promoting your membership site. They’ll run special promotions for your membership site when it launches and get you some of your first members to your site. Running a successful pay per click campaign can bring you a lot of targeted traffic to your sales page. Choose the right keywords, craft an attractive ad and you’ll have lots of new members. Sites like Facebook and Twitter can offer you lots of opportunities to connect with your niche market and get new potential members. Start a profile for your membership site and search for friends who are interested in your niche. This website is a good place to find questions that people are asking related to your niche. Search through the open questions a few times a week and provide helpful answers. Use your membership site link in the resource area to drive targeted traffic back to your site. If you already participate in a forum related to your niche, this will be an easy way to promote your site. Add a link to your membership site in your forum signature file. Each time you post, your sales page link will be promoted. Write a short report on a popular topic within your niche. Solve a major problem or provide a plan of action for your niche. Include lots of links back to your site within the report. Allow others to distribute it for free and your membership site link will get in front of thousands of potential subscribers. Contact bloggers and other product creators to give them free access to your membership site in exchange for a review. They’ll offer their opinion of the site to their readers and you’ll get lots of new traffic into the site. You can also find paid reviews sites that put you in connection with bloggers who will review your site for a small fee. Search for blogs in your niche and post insightful comments from time to time. 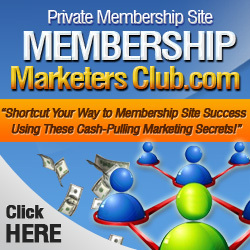 Use your membership site link in your blog comment and you’ll get some new visitors to your site.